An IoT platform needs to attract a healthy ecosystem of partners in order to scale. Firms use technical APIs to specify how technology components will work together. Forward-thinking firms apply the same logic to create ‘Business APIs’ that are simple, transparent and dynamic. Part 1 of this two-part series shows the role business APIs play in creating successful IoT platforms. If you are working on a new IoT offering — congratulations! So are lots of firms, of course, and those unseen competitors tend to dominate our thoughts. For example, it’s natural to think, “I need to really nail down the entire technical platform and business model before I let anyone see what we’re up to.” Resist that temptation. Instead, open up your development process, using a simple mechanism we call Business APIs, to attract third parties to join your IoT initiative. Together, you’ll dramatically increase your chances of creating an IoT platform that both scales and remains interoperable with a range of IoT ecosystems. “In healthcare, it’s an API economy. Success in the API economy requires you to think Big and Small, where Big means understanding value creation and exchange within large, interconnected systems, and Small means recognizing what components of your product are unique and abundant to you, and also can become valuable ‘ingredients’ to the products of others.” — Florin Fortis, Head of Digital Strategy & Innovation at Humana. Healthcare is hardly unique in this regard. Smart buildings, smart cities, smart homes, and smart highways — right down to the tires — all flourish when great products become ingredients in connected experiences. In the API economy, your IoT offering needs early partners before it can have early customers. “As we explore new solutions and business models, that necessitates new kinds of relationships. Blanket partnering policies are often irrelevant and onerous, but starting from scratch on each opportunity is too slow. It requires clear business model principles and just enough flexibility to get these early collaborations started.” — Abhijit Ganguly, Senior Manager of Incubations & Deployment at Goodyear. At the center of these collaborations, you’ll find three magic letters: A.P.I. 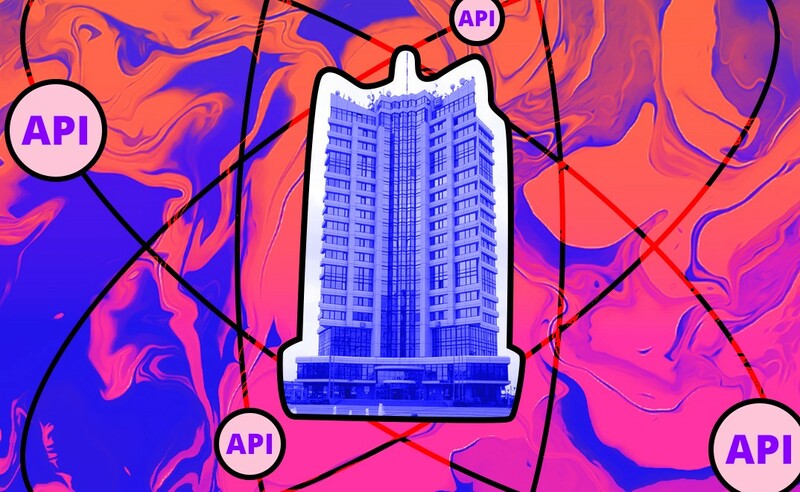 The API (short for application programming interface) is a set of (hopefully) simple and transparent rules that enable complex technology stacks to work in concert and adapt to change. At their best, good technical APIs can help products become platforms. There are actually unheralded business APIs, too, with equal power to determine how your solution scales and adapts to change. Typically, the business arrangements for these are negotiated case by case and codified as contractual terms and conditions (a.k.a., Ts and Cs). These complex, secret, one-off deals are an artifact of a bygone era. As Goodyear’s Ganguly noted, they inhibit collaboration and sow mistrust among contributors. There’s a better way. 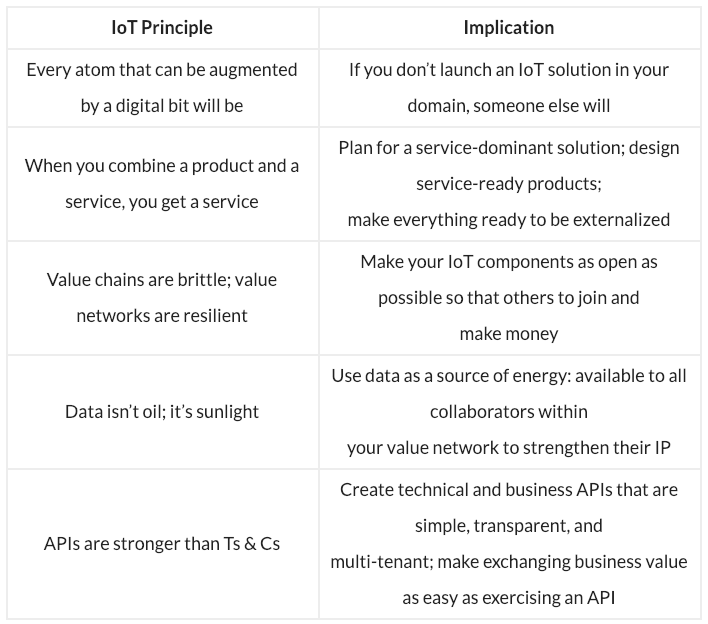 By viewing business and technical APIs as two parts of a whole — and by approaching them with common principles — your IoT solution can go from being a platform in theory to being a platform that scales. To understand the crucial role of business APIs, consider the recent evolution of IoT. In our experience as an IoT practitioner, we’ve gleaned a few common principles, which we’ve tabulated below. For IoT, we believe it’s no longer a question of closed vs. open architectures. The very premise of IoT demands interoperability. An internet-connected garage door opener can tell you the door status when you’re away, but it’s undeniably more valuable with a personal assistant and home security partnerships. And the value creation is reciprocal. With the exception of certain infrastructure and defense solutions, most IoT platforms benefit from the scale that comes from greater openness and not less. Good IoT business APIs are the key to rapid adoption. The Five Truths lead us directly to these conclusions. Now the question becomes, What are the rules of thumb for setting good Business APIs? We will turn to that in part two of this series, as we show you the “Three Rs” of IoT business APIs. Together, the Five Truths and the Three Rs comprise the essential rules for creating a successful ecosystem around your IoT platform. Co-written by Tim Ogilvie, Founding Partner of Peer Insight Ventures, and Mark Pontarelli, Director of Corporate Strategy at a fortune 100 company. This article was originally published by IoT For All on January 14th, 2019. Tim Ogilvie is Founder of Peer Insight Ventures, where he partners with change-makers, whether intrapreneurs or entrepreneurs, to accelerate growth ventures.